“My friends all wanted to know how I climbed up the glass to get out the test-tube!” laughs Scotland’s first IVF baby and the world’s first “test-tube” boy, Alastair MacDonald, who celebrates his 35th birthday on 14 January 2014. Alastair’s birth in 1979 was the best possible start to the year for his mother Grace MacDonald, who had never given up hope of starting a family. Grace received IVF treatment at the same time as Lesley Brown, the mother of the world’s first IVF baby, Louise Brown. It was only when a reporter turned up on her doorstep after Louise’s birth that Grace realised that her son would be the second “test-tube” baby to be born. She attempted to keep Alastair out of the spotlight as much as possible as a child to ensure he grew up a “normal little boy”. It was only when Alastair, aged nine, saw television reports on the death of gynaecologist Patrick Steptoe – and images of his “Uncle Bob” Edwards and friend Louise Brown – that he put two-and-two together and realised he was an IVF baby. He recalls: “You can let something like that put your head in a spin as it’s a big thing to think about, but I wouldn’t be here without IVF so I tried to understand it as best I could. When Alastair’s friends discovered he had a pioneering past they were intrigued and asked the young Scot lots of questions, some more cheeky than others. 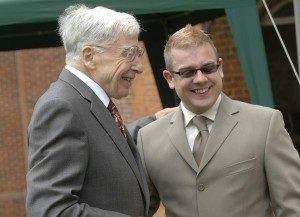 Alastair’s relationship with Robert Edwards remained close over the years and he saw the physiologist regularly until his death in April 2013. Paying tribute to him, Alastair described him as “the greatest scientist the world has ever seen”. To find out more about the history of IVF and Bourn Hall Clinic click here.